'Peak Oil Crisis' is a Peak Oil news and resource site for those interested in the issue of Peak Oil. We are UK based but are interested in stories from anywhere this global problem manifests itself. For those of you who haven't come across this phrase before, the term Peak Oil is used to describe the global maximum in crude oil production which is predicted to occur in the not too distant future (if it hasn't happened already). The concept was devised by geologist Marion King Hubbert who worked for oil company Shell and who correctly predicted that in 1970 the crude oil production within the United States would peak and then decline. He then went on to say that the same thing would happen to world crude oil production eventually. Once this maximum (or peak) has been reached global oil production will generally decline forever afterwards. It is something that will only become apparent some time after the event has happened due to fluctuations in oil production from year to year. At the moment it appears that oil production is on a plateau with a peak in conventional crude oil occurring sometime in 2006. Production is struggling to stand still let alone increase. It is thought that global oil production from mature oil fields is declining at a rate of around 5% per year. This means that at current rate of oil demand (heading towards 90 million barrels per day), more than 4 million barrels of new oil (crude & other liquid fuels) per day must come on line per year. This is just about happening at the moment but is getting harder everyday at oil becomes more difficult, expensive and energy intensive to extract. Also as a result of the current world economic problems and lower prices oil exploration activity has been curtailed significantly. Peak Oil is thought to occur when roughly half of the world's oil reserves have been used up. All oil fields peak and then decline by their very nature and the concept of global Peak Oil is simply the extrapolation of this idea to the sum of all known oil fields. Peak Oil is thought to be imminent because there have been fewer 'super giant' oil field discoveries in recent years to put any potential peak in production further into the future. New oil production is coming online but at the moment this is largely being counteracted by the declines in production from older oil fields. This, however, doesn't mean there aren't more very large oil fields to be discovered. Unconventional oil reserves (of which there are the equivalent of trillions of barrels) such as Tar Sands, for example, may become viable and the fear of Peak Oil may go away for this generation. However, as no new oil is being created (unless you believe in the largely discredited Abiotic Theory of oil) then a peak in the conventional oil that we are familiar with will eventually occur. Usable oil will not run out in the near future but prices will rise as global demand continues to increase (at about 2-3% per year) and attempts to outstrip a stagnating (or peaking) supply. The actual date that Peak Oil occurs is not as important as the fact that global oil output will probably fall short of demand. Of course, oil supplies may be constrained not just by geological factors but for other reasons as well including geopolitical instability (e.g. conflict, political manipulation / unrest), a physical shortage of rigs, a deteriorating oil infrastructure, lack of investment and a rapidly aging oil industry workforce. Once prices rise then demand for oil will eventually fall. Prices will then fall once again causing demand to once again pick up. As the difference between potential demand and an ever decreasing supply increases a ratcheting up of prices will occur. However, it is unlikely that prices would continue to rise indefinitely in the face of any declining supply as the price rises would curtail demand significantly enough to reduce demand back to equilibrium. However, prices would stay at a high enough level to have severe effects on those that could not afford such prices, even in the developed world. During the worst of the financial crisis and economic recession a few years ago crude oil demand was down by only around 5% from it's peak. During this economic crisis, which was probably triggered by the relatively high oil price spike in 2008, prices fell to almost $40 per barrel but it didn't take much of an increase in demand to push prices up again quickly. Any current slack in demand would easily be taken up in a climate of stagnating and ultimately declining global production. Here in the UK we are seeing the effects of the decline of North Sea oil. The North Sea saw it's second and final peak in oil production in 1999 which has since declined by about half. The UK is becoming a net importer of oil which is not a comfortable place to be if you want to maintain business as usual. 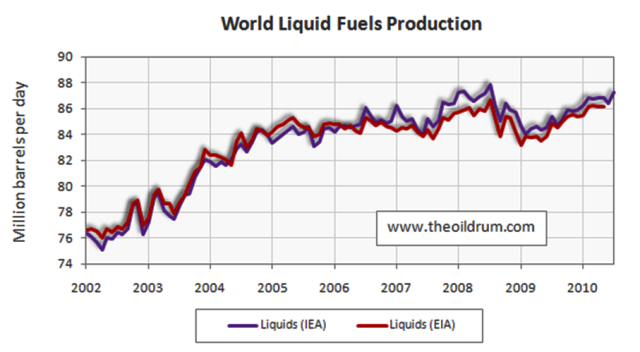 People constantly argue about the dates and what the effects of Peak Oil will be. 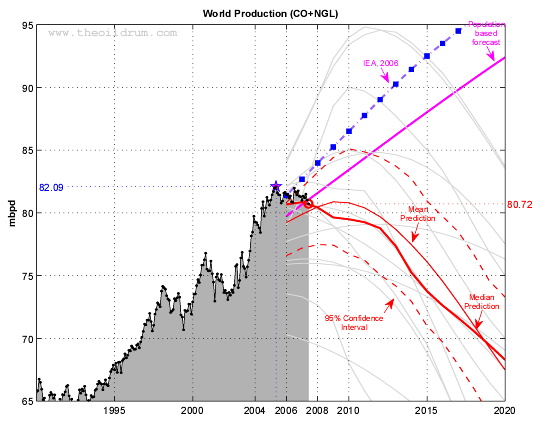 We are not 'end of the world' type pessimists as many who discuss Peak Oil are. We use the term 'Crisis' to simply mean the great change and transformation that will occur from the very wasteful system we have at present to a completely new system. For a start, something like 70% of all oil is used in transportation. So simple efficiency in this area will immediately have massive effects on oil usage. Over 90% of vehicles use some kind of fossil fuel. Overall, oil provides about 1/3 of the world's energy usage, most of it for use in transportation. Other forms of energy provide for our electricity needs such as coal, natural gas, nuclear and renewables such as wind, solar and hydroelectric power. These forms of energy as not really suitable as a replacement for oil as most oil is used in transportation and for manufacturing materials such as plastic and asphalt. We don't believe there will be any great 'die off' (war or cataclysm aside) as some Peak Oil advocates predict. For example, if you look at the third world, their populations continue to rise rapidly even though they use proportionally far less oil that we do in the West. We see great opportunities for new technology, much of which hasn't even been envisaged yet. We don't see a return to the stone age. The economic system will change radically as economic growth (and with it the ever increasing waste of resources) slows. We envisage a system of natural capitalism and a publicly owned non-inflationary money system. Our other sites include ukbankaccounts.co.uk and our credit site which has articles on business accounts, prepaid cards and credit reports. In the left and right hand columns you will see links to sites and articles which discuss the Peak Oil issue in greater depth, some of which are very technical in nature. Above you will find links to interesting current news stories regarding Peak Oil and the oil situation in general.